Igntion interlock devices (aka breath ignition interlock devices) IIL, BIIL are basically breathalyser devices that are fitted into a vehicle in order to help prevent drunk driving and monitor offenders. A vehicle that is fitted with an ignition intelock device requires the driver to provide a sample of breath before the vehicle will start. A predetermined BAC level is programmed into the device, if the sample of breath exceeds this predetermined BAC level then the vehicle will not start. A preventitive measure in place to help elimintate circumventing of the device is that of requiring the driver of vehicles fitted with an ignition interlock device to provide intermittent breath samples. This helps prevent possible abuse of the system such as drivers who may be over the limit getting friends to blow into the device on their behalf in order to start the vehicle. If an intermittent breath sample is not provided when required OR the BAC level of the breath sample provided exceeds the ignition interlocks preset blood alcohol level an alarm will be sounded (e.g flashing of headlights, horn honking etc). The alarm will be sounded until the ignition is turned off. Some ignition interlock devices take a digital photograph of the person who is giving the breath sample. All devices will log data about all breath samples given, including passes, warns and failures. The ignition interlock devices will be monitored and checked every 30, 60 or 90 days and all data will be collected, the device will also be recallibrated if need be. These devices also collect data about any attempts of circumvention and tamepering. If any evidence is found it will be reported to the relevant authority. 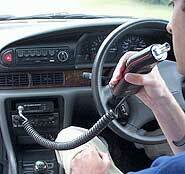 The installation and maintenance fees for ignition interlock devices will usually be billed to the offender.